Angular as a web app quickly became one of the hottest web technologies when its first version was launched way back in 2010. However post that there have been drastic changes with the world of world wide web. Hence, in 2014 when Google announced the making of Angular 2 there was quite a buzz. The web development community anticipated a lot from this update, because it was more like a brand “new” and better rewrite than the older version. And finally, today after numerous preview and beta releases, Google officially launched the final release version of Angular 2.0. In the near future, there are plans to provide developers with more guides and examples to help them learn Angular 2.0 faster. More work will be put into animations for Angular 2.0 and move its WebWorker support out of its experimental branch. 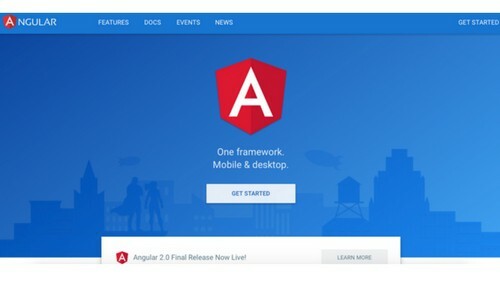 Another ambitious project is Angular Universal, a project that lets you render your app server-side so first-time users will quickly see a server-rendered version of your site. In addition to above things there are also plans of releasing Angular updates through three channels, namely major, minor and patch. While major versions are those that introduce incompatible API changes, minor versions will signal the addition of backwards-compatible functionality. The version numbers for the patch version ticks up as backwards-compatible bugs are fixed. When it comes to competing with other such frameworks, Facebook’s React framework is gaining steady momentum behind it. But, developers know that both projects hardly have anything in common. Stylistically, Angular is a far more opinionated framework while, React Native makes it easy to build native apps, for example. But here’s the catch Google doesn’t give developers who built applications with React 1.x an easy upgrade path, many of them are now looking at which technology to use next.